Ajay Devgn's jam-packed schedule is a major reason why he's ruling Bollywood currently. With a string of hits in his kitty, he's also the most bankable actor in the industry and his choice of movie genres range from an intriguing cop drama to comedies. If foraying into the South cinema with SS Rajamouli's RRR wasn't enough, the actor is all set to play the role of Squadron Leader Vijay Karnik in his next war drama. With as many as seven projects in his hand, he's all set to rule the box office for the next two years and it's quite safe to say that he's way ahead of his contemporaries. Kalank: Did You Know Karan Johar Wanted to Cast Shah Rukh Khan, Ajay Devgn, Kajol and Rani Mukerji in the Partition Drama? 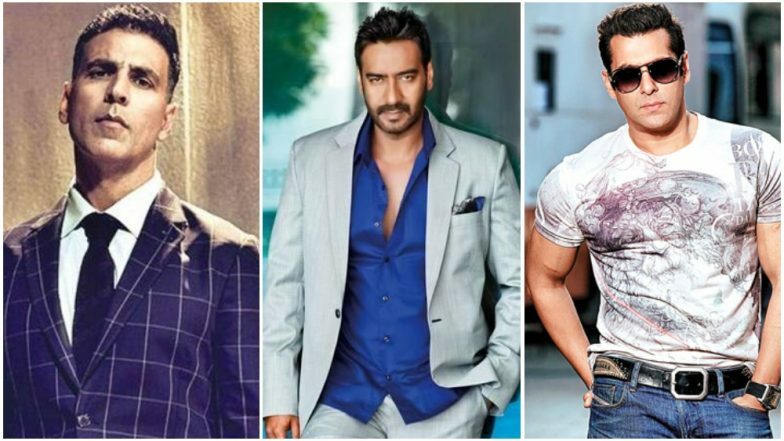 While Shah Rukh Khan is still busy wondering about his next outing and Salman Khan has Dabangg 3 and Sanjay Leela Bhansali's next in his hands, Ajay is ruling the number game with seven new releases. From a romantic comedy to a historical drama and later a sports biopic, he believes in breaking the rut and his movie choices always present a diverse range of genres. While competition is quite fierce in the entertainment industry, the Singham actor and his movie announcements make us think otherwise. We aren't kidding when we say he's set to rule the box office in the upcoming years and his filmography below is a proof of that. Have a look... Ajay Devgn Confirms Singham 3 Will Go on Floors Before Golmaal 5 - Read Details. Ajay Devgn will romance Tabu and Rakul Preet Singh in this romantic comedy that's slated to release on May 17, 2019. Ajay will finish shooting for this historical drama in May this year. The film is based on the life of a fierce warrior, Taanaji Malusare, who was a military leader in the Maratha empire. Ajay's collaboration with SS Rajamouli was a trump card. Apart from Alia Bhatt, even Ajay will share the screen space with Ram Charan and Jr NTR in this multi-lingual film. The movie will hit the screens on July 30, 2020. Ranbir Kapoor and Ajay Devgn coming together for a project was big news. It's a modern take on new age relationships and will hit the screens next year. Directed by Neeraj Pandey, Ajay Devgn is all set to play Chanakya, the greatest political thinker, philosopher, economist and royal advisor. Ajay will play a football coach in Syed Abdul Rahman biopic. The movie will also see South beauty, Keerthy Suresh mark her debut in Bollywood. The biopic will see him play the Indian football team’s coach and manager from 1950-1963. Ajay's newest announcement is Titled Bhuj: The Pride Of India. It's a biopic on Squadron Leader Vijay Karnik who was the in charge of Bhuj airport in Gujarat during the Indo-Pak war of 1971. We also read his comment on Singham 3 and how it will go on floors very soon. In his recent interaction with Mumbai Mirror, he confirmed the development saying, "Singham 3 will roll soon but we don't have a date yet."